The plant most commonly known as the sweet potato is Ipomoea batatas, a species in the Convolvulaceae, or morning glory family. In addition to its starchy, tuberous root, it also produces an attractive vine with heart-shaped leaves and funnel-shaped flowers that may be white, pale pink, or lavender. The leaves are edible and delicious and may be harvested and sautéed like other edible leafy greens for stir fries or soups or made into pesto. Sweet potatoes are widely available in North America and may have orange, brown, or golden skin, and their flesh may be orange or creamy golden, except for the Okinawan variety, which is deep purple. Certain sweet potato varieties are sometimes mislabeled as yams, but true yams are fairly difficult to find outside of international markets with a diverse selection of exotic tubers. There's always confusion about the relationship between sweet potatoes and other edible tubers, but Ipomoea batatas is not really botanically akin to either yams (which are in the Dioscoreaceae) or common potatoes (Solanaceae). Yams come mostly from West Africa and Asia (with only one species in the New World). They are monocots, with vines and leaves that have parallel venation, and are more closely related to lilies and grasses than to sweet potatoes, which are dicots. Yams may be the size of a small potato or much larger—they can grow to be as heavy as 50 pounds! They have a firm flesh that may range from purple to orange to golden. From a culinary perspective, the biggest difference between sweet potatoes and yams becomes more apparent when they are cooked. Yams are starchy and dry, but sweet potatoes are fluffier and the right consistency for this rich autumn tart. 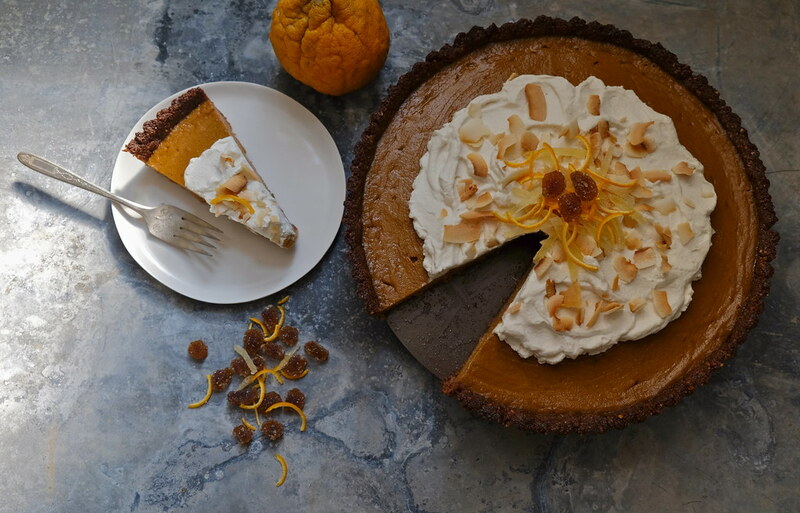 This gluten-free and dairy-free pie has a rich, creamy filling made with coconut milk that is a delightful contrast to the nutty-sweet flavor of pecans, dates, and coconut in the crust. Do-ahead tips: You can roast the sweet potatoes up to two days in advance and keep refrigerated: Wrap them in foil and roast at 400°F for 45 to 60 minutes or until a knife easily penetrates the flesh. The tart can be made a day ahead and served cold or at room temperature with maple whipped cream. Preheat the oven to 350°F. Place the pecans, coconut, sugar, dates, cinnamon, and sea salt in the bowl of a food processor and process until a coarse, sticky meal is created. Add the oil and egg white and pulse to combine. Transfer the sticky-wet mixture into a 10-inch fluted tart pan. Press to distribute the crust evenly across the bottom and up the sides. Prick the bottom with a fork and bake for 7 to 8 minutes or until the crust looks just dry. Remove from the oven and allow to cool completely on a wire rack. Place the eggs, brown sugar, and coconut milk into the bowl of a blender or food processor and process on high until thoroughly combined. Measure two packed cups of the sweet potato flesh and add with the spices to the egg mixture. Blend or process on high until smooth. Transfer the filling into the cooled tart crust and smooth with a spatula. Place the tart on a sheet pan and bake for 30 minutes, then lower the oven temperature to 325°F and bake for another 15 to 17 minutes, or until the middle sets. Remove from the oven and allow to cool completely. Partially excerpted from Sourdough: Rustic Recipes for Fermented Breads, Sweets, Savories, and More.